Funny how the boys’ fighting inspires some creative intervention on Mom’s part. See how many times you can bounce a ball in it. Use it as a start or finish line. Ball bouncing was definitely the favorite challenge. Use ping pong balls because they are light weight, have great bounce potential and are unlikely to break anything when the inevitable happens. 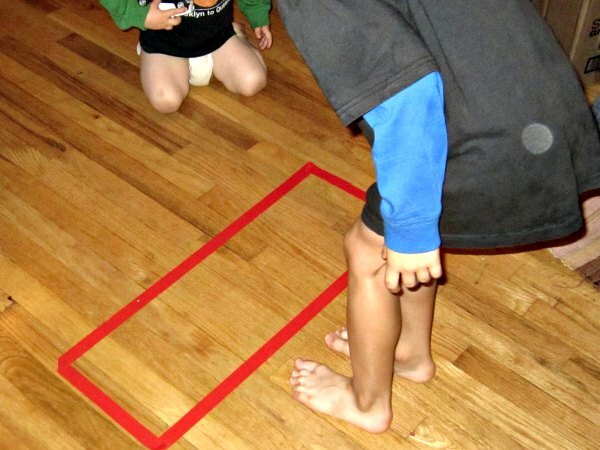 What do you think your kids would do with a rectangle of tape on the floor? Oh how I wish I could think that quickly! I love this idea! I might use it soon! Thanks! I have to try it out! It is something like thinking inside and outside the square, you could take this game anywhere with you ;). after my kids behavior today- they'd fight in it! That's funny I hope your neighbours forgave you. 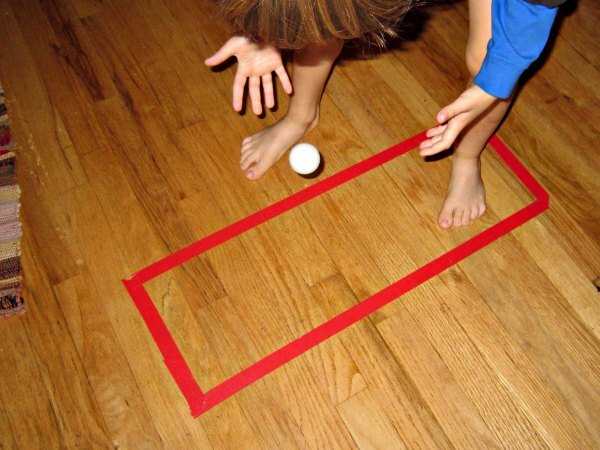 A 'sit down and put your shoes on' rectangle might work in our house?